IDF footage from November 15 shows a terrorist cell setting up Kassam launchers on a dirt embankment in northern Gaza near a busy intersection. After army intelligence confirmed the men were not civilians, the IDF launched its first attack against the cell, wounding several of its members. As the remaining terrorists attempt to flee the scene the army launches its second strike, killing all four of the cell members and destroying the rocket launchers. 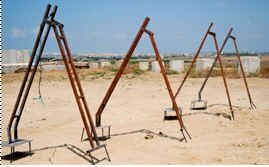 Since the Hamas took over the Gaza Strip in mid-June 2007 until mid February 2008, 771 rockets and 857 mortar bombs have been fired at Sderot and the western Negev. Rocket fire from the Gaza Strip continues as the preferred modus operandi of the Palestinian terrorist organizations. Most of the rockets are locally manufactured and have an approximate maximum range of 9 kilometers (6 miles), although some have a range of 12.5 kilometers (7 ¾ miles). In addition, also launched were a number of standard 122 mm rockets with a range of 20.4 kilometers (12 2/3 miles) which had been smuggled into the Gaza Strip. 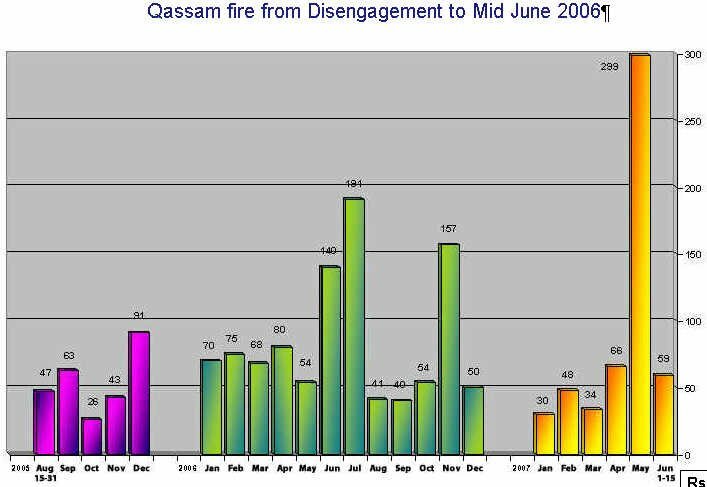 Since the disengagement there has been a sharp increase in the number of rockets launched at the western Negev. (Until the disengagement, massive rocket fire was aimed at the Israeli settlements in the Gaza Strip.) The preferred targets during 2006 were the city of Sderot and civilians living in settlements in the western Negev, although attempts were made to launch rockets as far away as Ashkelon. In 2006, 861 rockets were fired at population centers in the western Negev, as compared with 222 in 2005 and 268 in 2004 (not including rockets fired at Israeli settlements inside the Gaza Strip). 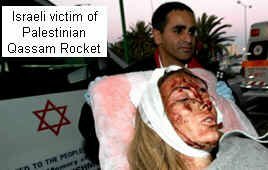 In May 2007, Palestinians launched some 300 Qassam rockets from Gaza at Sderot and the western Negev. Hamas openly claimed responsibility for the attack. 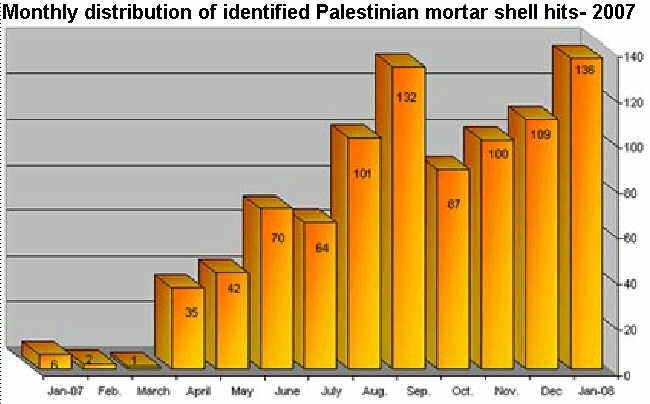 Note: Rocket or mortar shell fire is defined as an event, during which a launch is tracked and the hit is clearly identified as falling in Israeli territory. It is also defined as an event during which a launch from the Gaza Strip is tracked and an explosion is heard, even if the location of the hit is not clearly identified. The actual number of rockets launched may be at least 20% greater than the number of hits identified.